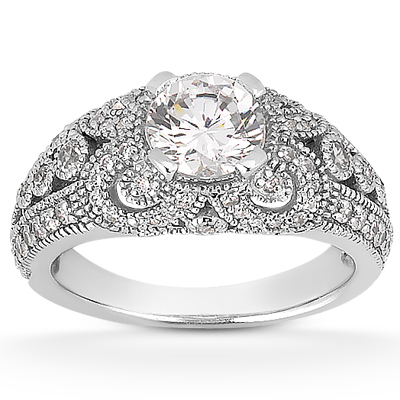 This 0.89 carat vintage style engagement ring in 14K white gold overflows with the glamour of times gone by. Over 64 diamonds give this piece abundant sparkle and make it a dazzling representation of love. 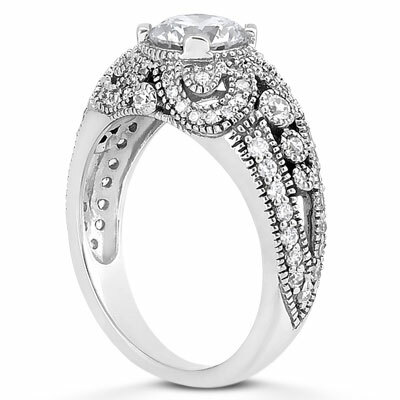 A half carat round diamond glitters from the center of this stunning 14 white gold ring, and it's accented by smaller diamonds that are arranged into an elegant vintage pattern and offset by delicate beaded edges. This sophisticated piece is sure to draw eyes with its lavish feminine beauty. 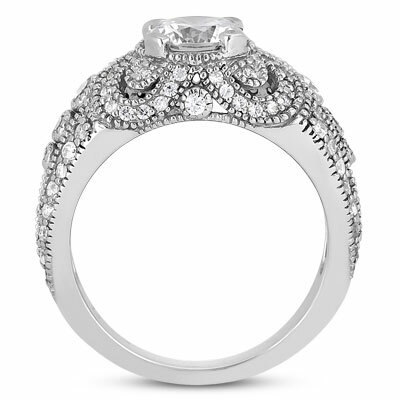 Vintage style 0.50 carat diamond engagement ring in 14K white gold set with 0.39 carats of side diamonds for a total of 0.89 carats of diamonds. Apples of Gold Jewelry guarantees the 0.89 Carat Vintage Style Engagement Ring to be of high quality and an authentic engagement ring with real diamonds, as described above.